Increasingly, project developers, consortia, enterprises or foundations are the commissioners of art in public space. QKunst has a lot of experience in art in public space for a variety of clients. Often, (re)building gives rise to realising art. QKunst accompanies the formulating of the commission, suggests artists or designers and tends the whole process, from design to implementation and management. We focus especially on the exchange of ideas between the involved parties, making sure the artist is given enough space to realise a special artwork and at the same time, creating public support for art. Especially for potential commissioners that are not yet or insufficiently familiar with commissioned art, we developed the hand out ‘Art on view’. Interested? Please contact us. The Kromhout Barracks (headquarters of the Royal Netherlands Army), nearby Galgenwaard Stadium in Utrecht, houses about 3500 defence employees. Commissioned by ISS Facility Services for builder Bouwcombinatie Komfort, online gallery ArtOlive took care of all the art on the military grounds, including five large-scale commissioned artworks. 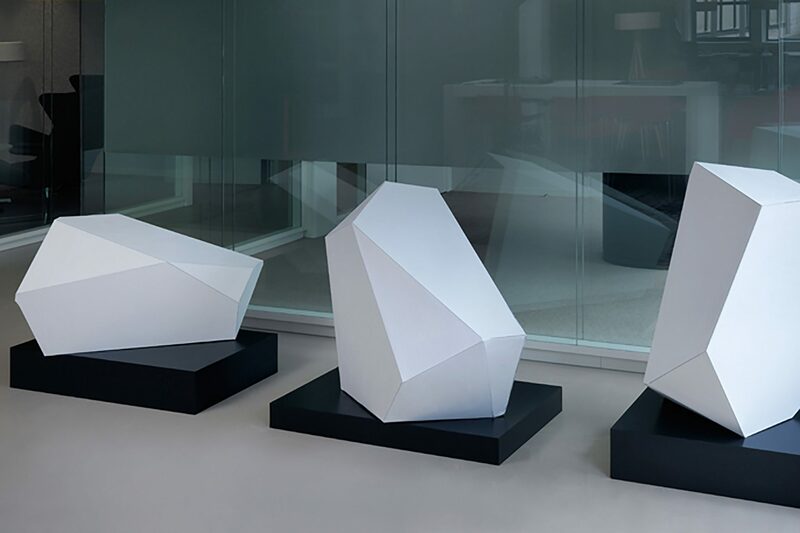 ArtOlive asked QKunst to manage these art commissions: defining the starting points, selecting the artists, judging the designs together with the art commission, and taking care of the project communication. 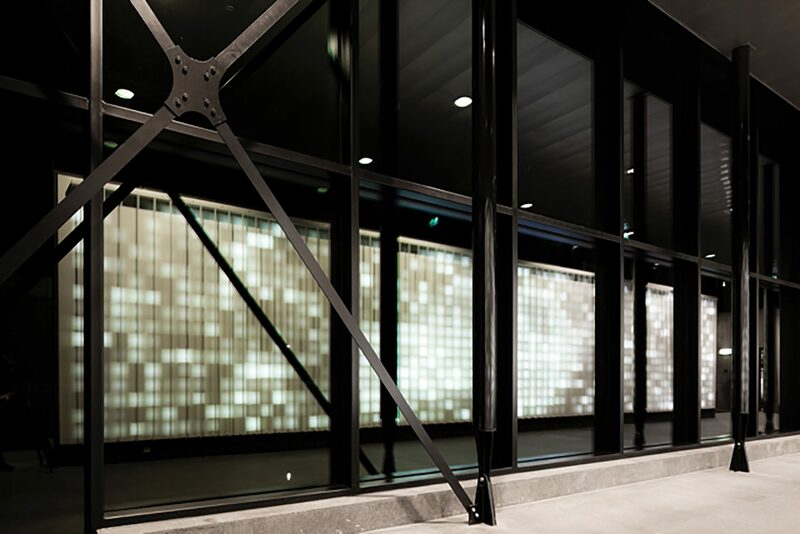 All in close cooperation with then Meyer en Van Schooten Architecten. The artworks were completed in 2011. Would you like to know more? Contact us to request the special publication about the project: ‘Not your average fare – Art for the Kromhout Barracks’. QKunst is preferred partner of the Rabobank. For a number of offices, commissioned art was produced. QKunst introduced suited artists and lead the art commissions from design to realisation. In the work that Saskia Noor van Imhoff (1982) made for the Rabobank office in Nunspeet, shapes from traditional costumes from the area return in an abstract form in an installation composed of sculptures made of bronze, wood and plaster, photography, and in a tapestry that was woven at the Textile Museum in Tilburg. Since her commission for the Rabobank, Saskia Noor van Imhoff had exhibitions in the Stedelijk Museum Amsterdam, Kunsthal Rotterdam and the Hermitage Amsterdam. The Van den Broek Lohman Fund Nunspeet wanted to honour the life and work of François Adriaan Molijn (1853-1912) with an artwork. 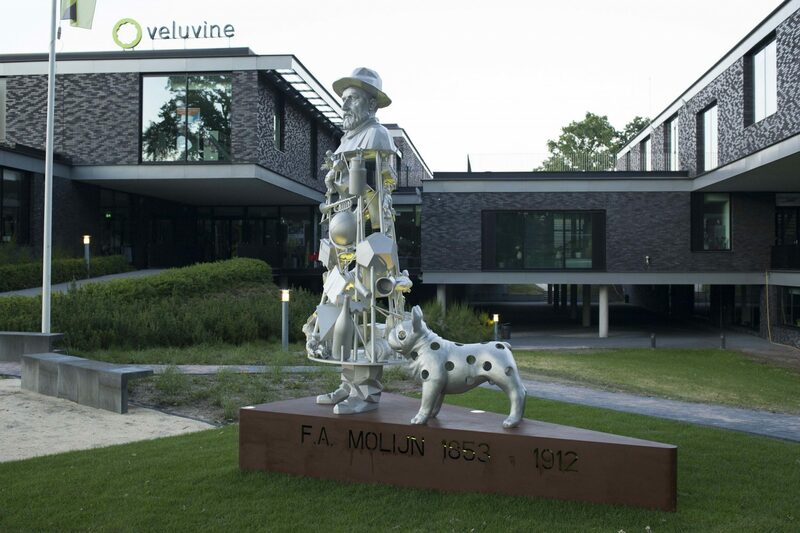 Born in Rotterdam, Molijn created the Veluvine paint factory in Nunspeet (Veluwe area). He was an inspired and committed entrepreneur, who created jobs, education, housing and social services in Nunspeet. As a location for the artwork, the fund chose the terrain of Cultural Centre Veluvine. QKunst accompanied the organisation of the procedure, formulated the commission and made a first selection of artists. The board of the art commission included three students of the nearby high chool. After the presentation of three designs to the inhabitants of Nunspeet, the commission chose the design by Nicolas Dings (1953), who combines an iconic portrait of Molijn with historical stories about the social impact of the entrepreneur.